A diamond’s carat weight is the measurement of how much a diamond weighs. Each full carat can be subdivided into 100 points, which allows a precise measurement to one-hundredth of a decimal place. Diamonds weighing less than one carat may be referenced by it’s “points” alone. 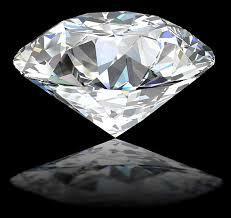 For instance, a jeweler may refer to a diamond that weighs .40 of a carat as a “forty pointer”. In contrast, a diamond weighing greater than one carat is expressed using carats and decimals, for example a 1.05 carat diamond is called a “one .05 five” carats. If all of the other qualities are the same, the diamond with the higher carat weight will be more valuable, because larger diamonds are highly sought-after due to their rarity. In contrast, diamonds of equal carat weight can have different values based on the other diamond 4Cs, clarity, cut, and color. Certain carat weights are referred to as “magic” sizes. These are .50, .75, and 1.00 carat. Be mindful that even though there is little difference between a .48 and a .50 diamond (all other things being equal), the price of the .50 carat may be significantly greater since it has reached the “magic” size.